The 2016 Irish Footgolf League began in earnest on Saturday at the Footee course in Tallaght. Despite the typically wet Irish weather, there was little wind and the course was in great condition for the time of year. Still, it was proper wet, and cold. And wet. With 9 of last season’s top 10 lining up and with new players and clubs on show, it was shaping up to be a really competitive event. And it didn’t disappoint. 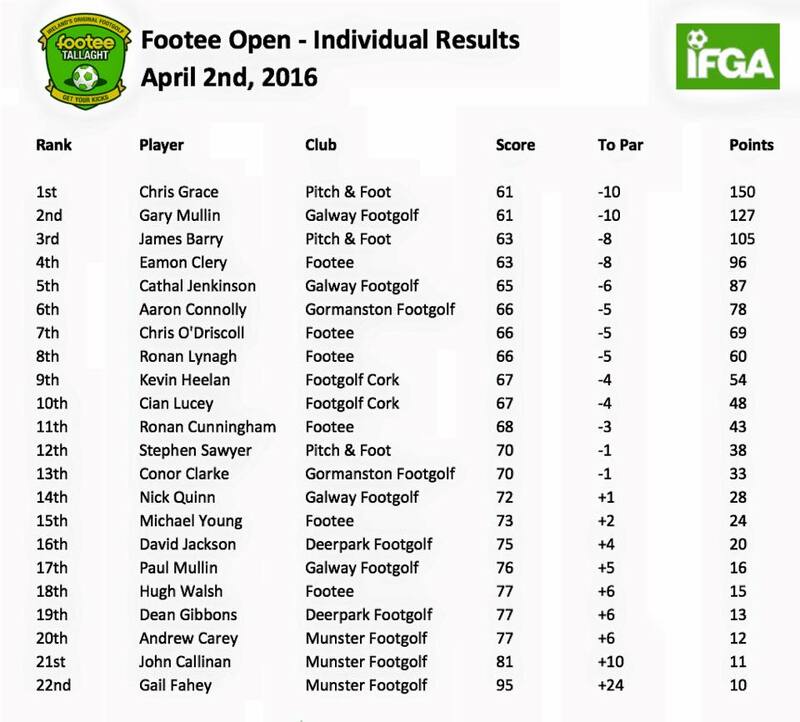 Just 6 shots covered the top 10 players, and the top two in the field – Pitch & Foot’s Chris Grace and Galway Footgolf’s Gary Mullin (both 10 under) – took it to a playoff to decide who would take the Footee Open crown. Grace didn’t need much time as he snatched victory from Mullin with an outstanding eagle on the 1st playoff hole to take down the first league event of the season. James Barry (-8) finished 3rd to make it a 1st and 3rd for Pitch & Foot, while other notable performances came from Aaron Connolly (-5) representing the newly established Gormanston FG, and who has progressed really well since his World Cup exploits in Argentina (he also won the first Hole-In-One jackpot for 2016). Footgolf fledgling and competition first-timer Chris O’Driscoll (-5) from Footee could be one for the future, while Galway’s Nick Quinn (+1) looks to have made serious inroads since his first European competition, the Winter Masters at Casares Footgolf Club in Marbella. 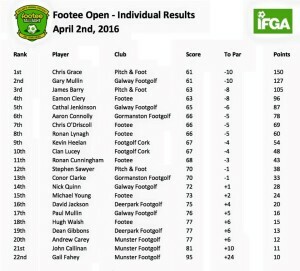 In the Club competition, Footee just held on to take the maximum points on offer, followed by Pitch & Foot and Galway FG. The battle for the 2016 Club title is going to be very hotly contested this year! It was great to welcome three newly established clubs to the Footee Open – Galway FG, Gormanston FG and the brilliantly dedicated Munster FG who were represented by the sole female participant, the effervescent Gail Fahy. Next up is the first Double-Header of 2016: the Gormanston Open (a.m) and the Deerpark Open (p.m) on Saturday 7th of May. We look forward to welcoming you there.